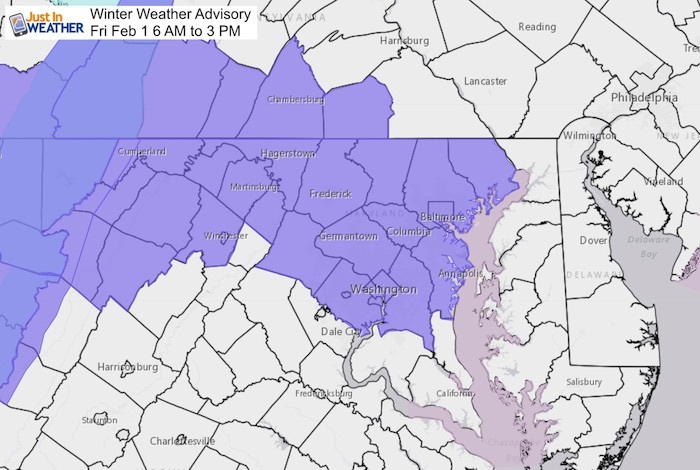 A Winter Weather Advisory has been issued for much of Central Maryland for Friday February 1. NWS included metro Washington DC but did not included York or Lancaster Counties in PA. I don’t fully agree. The latest HRRR Model supports my thoughts of this likely to verify a little farther north. Below you can compare two models and see the most likely impacts will be north of Rt 50, with a much better chance near and north of I-70 into southern PA. Southern PA should be in the snow most of the day. But most areas will be one inch or less. The clipper is dropping impressive snow across the Midwest, but is expected to lose some energy across the mountains. The tricky part here is watching where it crossed the mountains. That can determine where the cutoff will be. 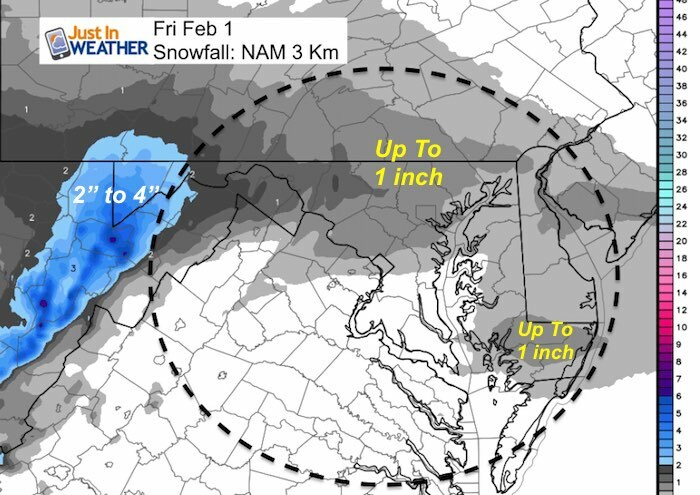 Below the models are split either bringing it along Rt 50 and Washington/Annapolis, to I-70 to Baltimore and north. I think York and Lancaster Counties in PA should be prepared for a snowy day. This will be a light snow, but temps are very cold. As it develops during the morning, all flakes that fall, will stick. In fact the flakes will be very dry and fluffy. That also means they will blow around easily. This clipper will be with us all day, but the totals are likely to be 1 inch or less in most areas. So all the questions about school impact, that’s hard to say. I think there will be some stickage, but this is a very light snow event. 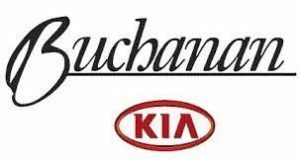 Enough to be a nuisance. The last few images look heavy (darker blue). Snow might pick up in our areas (where it is falling) around lunchtime. There will be a cut off in central Maryland. This will be close to Baltimore. Little to no snow south of Baltimore after the initial morning arrival. This will develop over central Maryland during the morning commute. 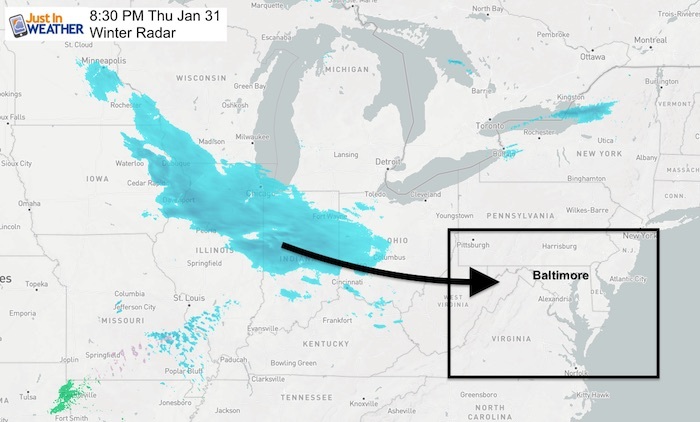 By lunch time, most of the snow will be north of Baltimore. Then redevelop over the Eastern Shore and lower Delmarva/Beches by evening. Again, just enough to coat the ground and possible be a nuisance. 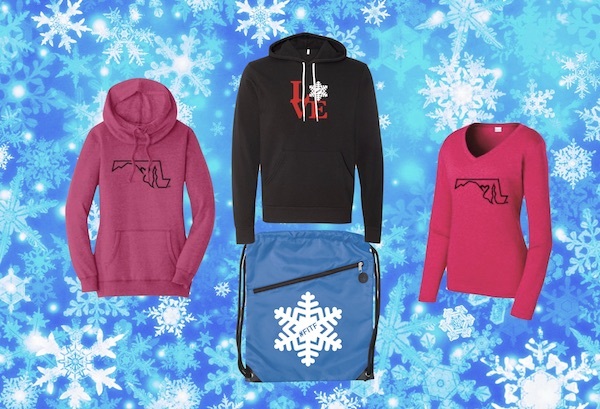 Any Love Snow or Love Maryland item is 15% Off until Sunday. The first 15 orders get our new FITF bag. Orders after that get another surprise gift. The Jet Stream will lift the Polar Vortex to our north and the return of very warm air next week could bring us to near 60ºF. Then another arctic blast arrive by Valentine’s Day.